High quality printed 15mm wide and 900mm long lanyard. 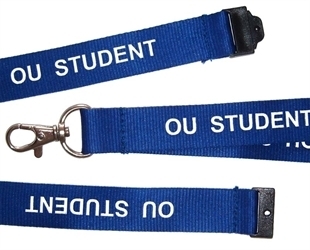 These lanyards are ideal for security, staff, schools, and promotional purposes. The 15mm wide design is a very popular size providing comfort and a good size to see text and logos. For ease of use a metal trigger clip is included to attach to standard badge holders or punched hole/slot in a card. A breakaway safety clip is also included to prevent injury if the lanyard gets caught or is pulled. There are no extra charges for clips, proofs, etc. It doesn't even matter whether you want a single colour text, or a colour logo, it's all the same price. Once the order is placed we will contact you to get your design sent through. Select the lanyard colour you require. You provide the text and / or images you want added to the card. Within 1 working day we will send you a proof for approval. Lanyards normally despatched within 10-12 working days from proof approval. For quantities above 1000 allow an extra 2-3 days.